Guest room looking out onto the Japanese garden. 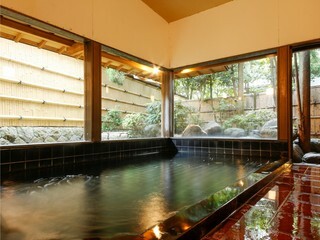 One of our newly remodeled guest rooms, now with it's own open-air bath. Enjoy watching the changing of the seasons in our garden. 13 rooms the central courtyard w/ full bathroom, 7 rooms with open-air bath, 1 villa room with cypress wood bath, 2 spacious rooms with massage chair no bathtub, all rooms with bidet restroom. 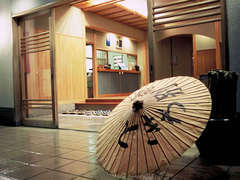 Men and women segregated public bath total capacity 25. 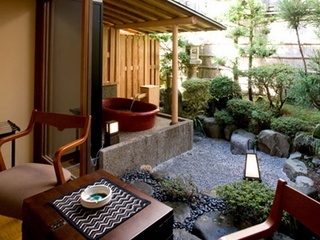 Gentlemen's side has a beautiful but rustic stone open-air bath. 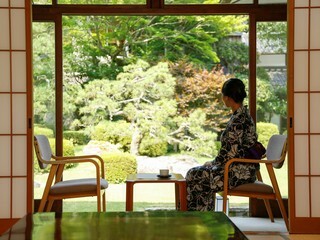 The Ladies' side has a refined open-air wood bath made of Japanese cypress. -Concierge help to reserve a golf or tennis activity. There is a tour bus/shuttle that runs between the station and all the inns (check-in is from 3:00p.m.). This shuttle is used by all the inns. The shuttle guide can be found in front of the train station, to catch a ride please tell the guide, 'I would like to go to Tokiwa Inn.' The shuttle is free for guests staying at the inn. However, the shuttle stops running at 6:00p.m. Guests who arrive past 6:00p.m. to the station will have trouble getting a shuttle. Please call the inn immediately if you know you will be late so that we may assist you.